Vivianna Castillo-Roybal doesn't have a typical relationship with her two younger brothers, Fernando and Elanzo. Coming from a "neglected" home, Castillo-Roybal said she was more like a mother figure to her brothers, even showing up to their teacher conferences in place of her parents. They helped her out, too. When she was suffering from anxiety and panic attacks, only her brothers knew how to calm her down. But when Castillo-Roybal was 13, she was separated from her brothers and placed in a different foster home. She was allowed to see them only once every six weeks, and if she acted up, her contact with them could be revoked as a punishment. "It was extremely traumatizing for all of us," she said. "The only two people in the world who knew exactly what it felt like to be in our situation, and suddenly I didn't see them anymore." 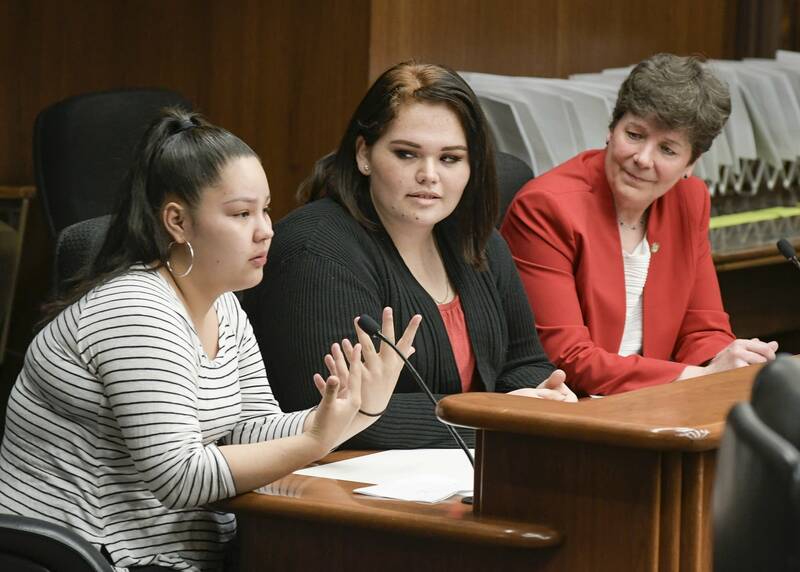 This year, Castillo-Roybal, now 19, was part of a push at the Legislature to make sure other kids aren't separated from their siblings when they are placed in foster homes. With other children who lived in foster care, she helped write the first draft of the foster care sibling bill of rights, which creates guidelines in state law to keep siblings placed together, or at the very least to facilitate regular contact, including in-person visits, social media or phone calls. The Republican-led Legislature passed the bill, and Gov. Mark Dayton signed it earlier this month. In a session where many proposals of significance were vetoed or didn't make it to the finish line, it was a rare example of success. Even as other bipartisan issues were falling apart in the final days of session, the foster care sibling bill of rights managed to make it through, in part because it was the foster kids — not legislators — who shepherded it through every step of the process. The effort began in fall of 2016, when Castillo-Roybal was part of a group that traveled to a conference for youth foster children in Washington, D.C. They met kids from other states, including some with policies that prohibited siblings from being separated and kept from contacting each other. On the way back to Minnesota from Washington, she and several others started writing their ideas on airplane napkins. By the end of their flight, they had the first draft of the sibling bill of rights. "We were all new to this and didn't know this was something going on nationwide," Castillo-Roybal said. "We just kept asking for more napkins." They presented the idea to people they knew at the YMCA of the Greater Twin Cities, who connected them with sources in the Minnesota Department of Human Services. By the time the 2018 session rolled around, Rep. Peggy Bennett, R-Albert Lea, signed on to carry the bill in the House and it was scheduled for its first hearings. "I just thought: It's just common sense, this should already be happening," said Bennett. "I just give kudos to those young people for doing something like this, because it's going to have a positive impact for kids for generations." Bennett invited several of the women who helped draft the bill to the House floor for the vote. They broke into tears when the voting board lit up green: It passed unanimously. "It was a really emotional moment," Bennett said. "They were just so overwhelmed to see it pass." In the end, the sibling bill of rights was included in a massive, 990-page budget bill that Dayton vetoed over other objections. At first, supporters weren't sure if that meant their proposal had died along with it, but then they got good news: He signed it in another, standalone bill. "My jaw dropped," Castillo-Roybal said. "Something that started on the back of airplane napkins is now a flipping law?" That success has inspired her to push for more changes. Castillo-Roybal and others are now drafting up a broader foster children bill of rights, which has passed in other states. The proposals inform foster children of their rights and create guidelines to keep foster kids involved in school, extracurricular activities and provide them access to mental and physical health resources. Despite her efforts, Castillo-Roybal is still struggling to stay connected with her brothers, who are now living with her biological mother. But under the new law, each child placed into foster care must be shown the sibling bill of rights. She hopes other kids can use them to stay connected with their brothers and sisters. "That part has been hard for me, especially after being a parent figure to them for so long," she said. "I feel like if I would have been able to maintain a better relationship with them I could have had more influence in keeping them on the right track. I guess I just hope other people get that chance."